Every experienced Network Engineer and System Administrator will agree with the fact that firewalls are an essential part of every network. They provide essential security from the outside world and hacking predators which are patiently waiting to exploit every possible mistake you can make when you are implementing your network. The standardized definition of firewalls, which use various rules to protect your network and control the traffic both coming in or going out of the firewall, has changed over recent years. Lately, firewalls have been produced to offer a lot more than just policing. They have been given new and more complex capabilities. One of the most important to note is their ability to look deeper into the packets traversing through them and being able to gather all that information and implement it in a way that would be the most beneficial for the network they are protecting. This deep packet inspection is the main feature with Juniper’s SRX Series Gateways and even though Juniper haven’t invented it, they worked on finding the most suitable way to solve problems their customers face. They used various methods to achieve this and worked from the ground up on the complicated new SRX platform which made them influential among the biggest enterprises in the world. Juniper SRX Series Gateways are known as the beginning of Juniper’s “attack” on global Service Providers. They are the first devices that have been migrated from the previous Screen OS operating system to the new Junos OS which provides a more in-depth view in configuration, maintenance, and operation. Junos is a state of the art operating system based on FreeBSD which is a UNIX implementation. Therefore, engineers can execute standardized UNIX commands. Besides the many features that Junos OS provides, one of the highly attractive ones is the option to change how the device is inspecting and processing the traffic. Or, in other words, manipulate traffic based on yours or your customer’s needs. It’s important to note that different networking vendors have different solutions that handle passing traffic. With Juniper SRX devices, this is done by changing the default mode of operation of the device. There are two options you can choose from: flow mode and packet mode. The most common definition that can be found regarding these modes, and the difference between them, is: flow mode traffic processing analyses all traffic passing through by the state or session of traffic while packet mode processes all traffic as a traditional router, widely known as per-packet basis. It is worth mentioning that all Juniper SRX devices work in flow mode by default. Let’s dig in a bit more in how these modes operate. For this sample deployment, we are going to use a real-world example of how flow mode is deployed on a Juniper SRX platform. We are going to focus on the SRX device deployed on customer’s site and specifically on customer’s requirements. This sample deployment will show the sample configuration, including the needed steps to take when configuring it. 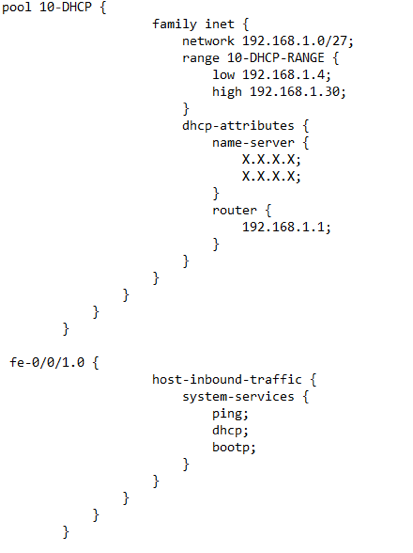 A DHCP server to be configured on the Juniper provided by their Service Provider. They require a separate private IP block assigned by the DHCP, to use for Internet browsing. The customer used to browse the Internet with a public IP block. This public block would have been routed in the core network of the Service Provider. The customer would like to use a private block instead. 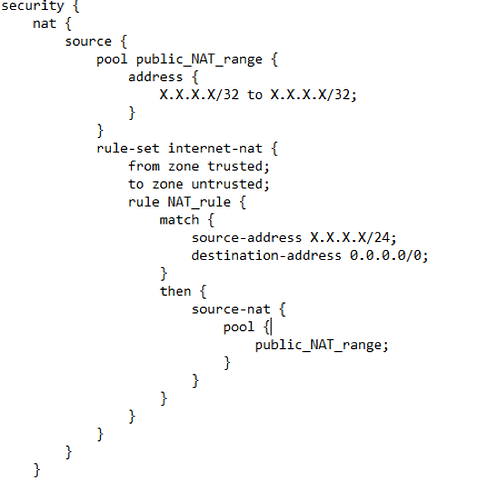 This means that a protocol called NAT will have to be implemented. This protocol will translate the private IP block in a single public IP address. A DHCP configuration will have to be deployed to assign IPs from the private IP block. 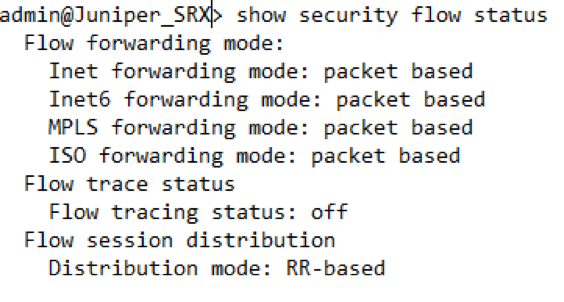 The Juniper SRX will have to be configured to operate in flow mode. If these hits are incrementing the NAT works as expected and the private IP block is being translated into a public IP address. 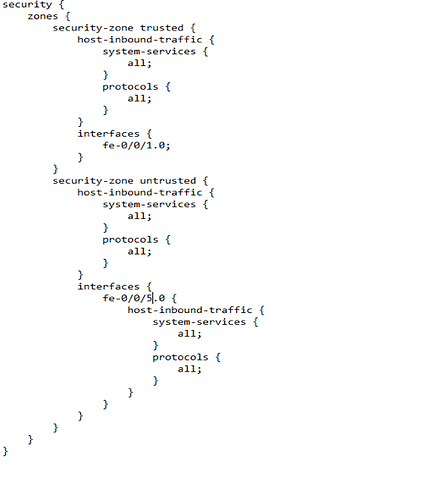 Customer successfully browses the Internet with a private IP address. In this brief article we covered the basics of Juniper’s SRX series devices and we only scratched the surface of their networking capabilities. 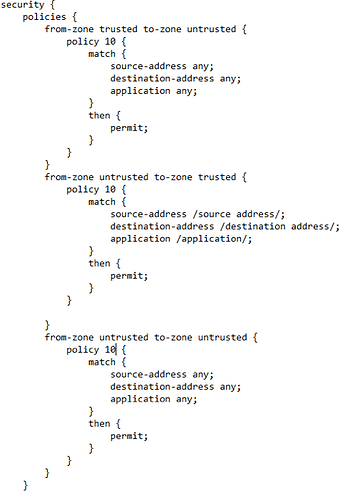 If we go deeper and research all their capabilities, we will end up with hundreds of pages of definitions and configuration examples. In the end, we will end up concluding that Juniper SRX devices, which operate on Junos OS, have a lot more capabilities than most firewalls currently on the market. In addition, we covered a configuration sample and the basics needed to manipulate the traffic with the flow mode forwarding option, which allows us to implement a more complex solution to meet the client’s requirements. When it comes to processing traffic, you can choose from a wide variety of options that will best suit your network. By knowing and understanding how these modes and the separate policies work, you have the possibility to create a powerful tool to protect your network. Thank you to Bojan Janevski for his work on this article.